Cutworms do a lot of damage to young plants. The eat the stems of plants and the damage done most times will kill the plants. 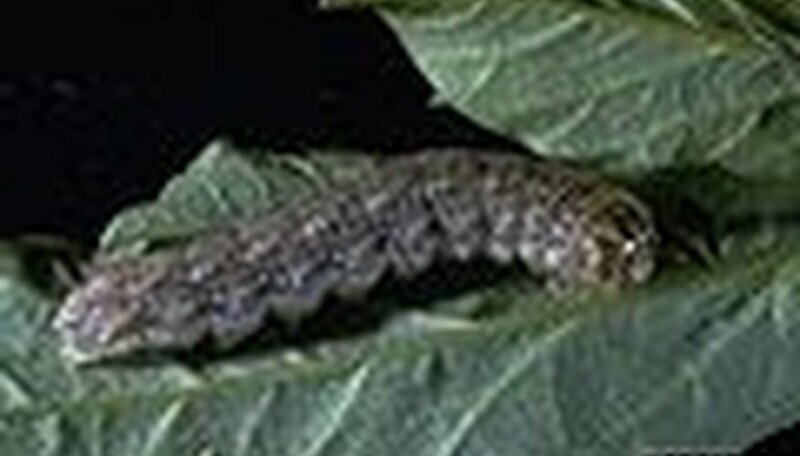 Cutworms are the larva form of many different species of moth. Cutworm doesn't refer to one specific type of moth. It is a collective term used to group them. Spray the ground around young plants with black pepper spray. To make black pepper spray: add 1 tablespoon of black pepper to about 10 to 12 ounces of boiling water. Allow the water to sit overnight. Pour the water through a coffee filter to strain the black pepper. Pour the remaining water into a spray bottle and spray the ground around young plants. Repeat after a rain fall. Recycle old toilet paper rolls by placing them over young plants. Push the toilet paper rolls about 1/4 of an inch into the ground. This will keep cutworms from eating the young plants. If you take away their food source (your young plants) they will move on to look for other food. Mix sawdust, bran and dark molasses to form thick, gooey mixture. Place the mixture into a squeeze bottle and squeeze a circle around each young plant. As soon as a cutworm touches the mixture it will begin to dry up and die.